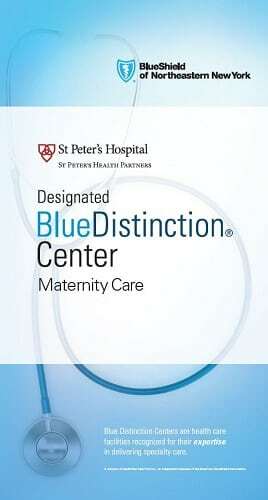 St. Peter’s Hospital, an affiliate of St. Peter’s Health Partners, has been designated a Blue Distinction Center for Maternity Care by BlueShield of Northeastern New York, as part of the Blue Distinction Specialty Care program. Nearly 4 million babies are born every year in the United States, making childbirth the most common cause of hospitalization, and cesarean sections the most common operating room procedures, according to National Center for Health Statistics and the Agency for Healthcare Research and Quality. In 2017, approximately 2,950 babies were delivered at St. Peter’s Hospital. The hospital’s Birthing Center, where moms labor and deliver, combines the ambiance of a home-like setting with experienced staff and sophisticated technology to promote a safe birth. The Birthing Center features nine birthing rooms with private showers, two hydrotherapy tubs, and three operating rooms for cesarean deliveries. To ensure the safety of moms and newborns, the Birthing Center offers complete obstetric anesthesia services 24 hours a day. The hospital’s neonatal intensive care unit (NICU), a Level III facility, is staffed 24 hours a day with board-certified neonatologists, neonatal nurse practitioners, and registered nurses certified in neonatal nursing.